If the UK were to hold another EU referendum, would the public now vote to Remain? Davide Morisi writes that while opinion polls have a patchy record of success in forecasting recent elections, the so called ‘wisdom of the crowd’ could potentially provide more accurate predictions. 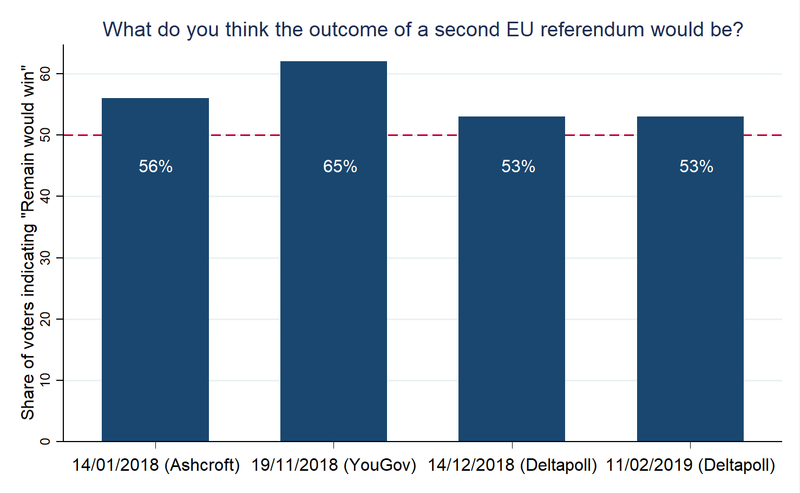 When voters were asked which side they thought would win in 2016, a majority thought the Leave side would prevail; yet if this exercise is repeated today, voters appear more likely to believe Remain would be successful in a second referendum. The underlying idea is that the process of public opinion formation is inherently a social process, and that citizens have a kind of knowledge or intuition about their surrounding social environment that cannot be captured by simply aggregating individual preferences. Indeed, in a recent study co-authored with Thomas Leeper, we found evidence that this is the case also in a referendum campaign. Around a month before the 2016 Brexit vote, a sample of British voters predicted the outcome of the referendum with a high degree of accuracy. 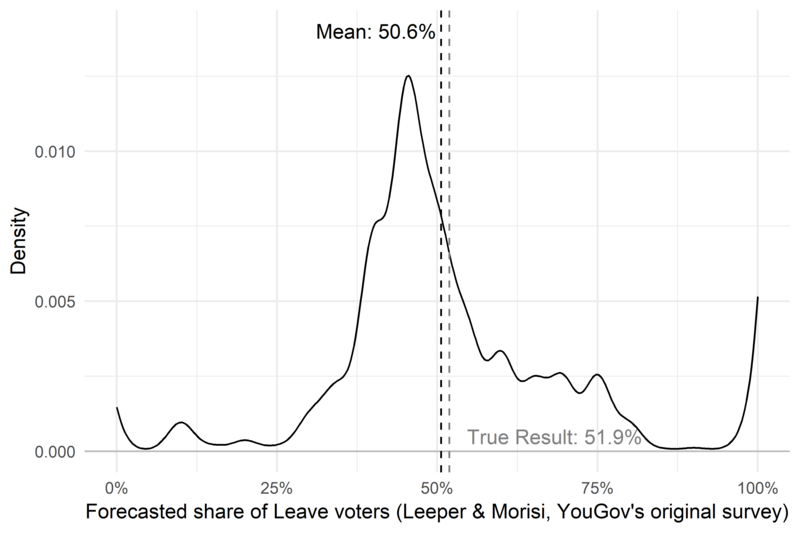 Figure 1 shows a density plot of the forecasted share of “Leave” votes in the Brexit referendum. The horizontal axis shows potential results of the referendum; higher peaks indicate where more respondents thought the outcome would fall. Despite a peak of the distribution below 50 percent, the average, weighted forecast slightly favours the Leave side (at 50.6 percent), falling short of the true referendum vote share for Leave (51.9 percent). A significant share of respondents forecast a 100 percent chance of a Leave vote, while a few others predicted a 100 percent chance of a Remain vote. However, if we trim the variable including only those who reported forecasts above 10 percent and below 90 percent, the average forecast still remains above the key threshold of 50 percent, slightly shifting to a predicted share of 50.3 percent of Leave votes. We replicated the analysis using data from Wave 7 (14 April-4 May, 2016) and Wave 8 (6 May-22 June, 2016) of the British Election Study (BES) Internet Panel. Both waves included the question “How likely do you think it is that the UK will vote to leave the EU?” The respondents could choose a number on a 0 to 100 scale, with zero labelled “UK will definitely vote to remain in the EU” and 100 labelled “UK will definitely vote to leave the EU.” Although this question asks to report a probability and not an expected percentage of voters, the results are substantially the same as our results. 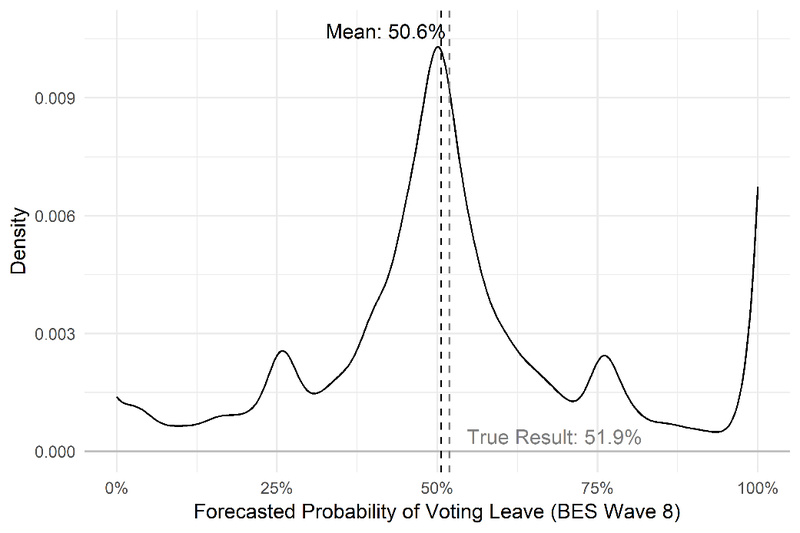 As the plot in Figure 2 shows, the average forecasted probability of voting leave in Wave 8 of the BES Internet Panel was again 50.6 percent. If we focus, instead, on the data from Wave 7, the predicted probability of a Leave vote slightly declines at exactly 50 percent, which is still a pretty accurate result considering that the survey was conducted around two months before the vote. These results confirm that on average citizens can provide accurate forecasts even of high-stake referendum campaigns, in line with previous studies showing that voters accurately predicted the results of both U.S. presidential elections and UK general elections. However, our study indicates also that important differences exist within the electorate. In particular, we find that older people, wealthier people, and those with high education provided more accurate forecasts than their relative counterparts. On the other hand, those who intended not to go to vote in the Brexit referendum provided significantly less precise forecasts than either Remain or Leave voters, thus suggesting that involvement in politics proves relevant for forming an accurate picture of the social reality. Can citizens predict a second Brexit referendum? Since the beginning of 2018, we have found four opinion polls that include a simple form of citizen forecasts. The respondents were asked whether in their own opinion it was more likely that either the Remain side or the Leave side would have won in a second referendum. Figure 3 illustrates the results: according to the data retrieved from the What UK Thinks website, in each opinion poll, a majority of voters predicts that the Remain side would win. It is important to keep in mind, however, that a large share of undecided respondents – ranging from a quarter to a fifth – has been excluded, and that a result of just below 50 percent would still be within the margin of error of the latest survey by Deltapoll. In sum, our results indicate that a possible way to predict the outcome a second EU referendum would be relying on citizen forecasts. If Article 50 is extended and British voters have a second say on the Brexit process, pollsters should consider adding questions on voters’ expectations about the outcome of the referendum. While relatively inexpensive, such questions could yield potentially more accurate forecasts than simple aggregation of individual preferences, especially if pollsters were to give more weight to respondents who are generally more accurate. Note: The author gratefully acknowledges the financial support of a Danish Council for Independent Research Sapere Aude grant (DFF-4003-00192B). This article gives the views of the author, not the position of EUROPP – European Politics and Policy or the London School of Economics. An interesting approach, though I find it hard to believe that many people will have accurate perceptions of how others will vote beyond those who they normally socialise with and who, therefore, are most likely to share the same views as themselves. Hence, getting an adequate sample must accordingly also depend on involving the same wide range of different people as any other poll, and be as subject to the errors of failing to do that as anyone else? Howver that may be, it is surely significant how vehemently the great majority of Brexiteers seek to resist any new referendum, even though, given the huge range of possible ways in whch ‘Leave’ might be achieved, it is far from unreasonable to ask the electorate whether or not the particular terms on which it is now proposed the UK should leave the EU are preferable to those we have by staying in? They, almost to a man and a woman, seem to expect a second referendum to result in a vote to Remain. Why else castigate those calling for another vote as betraying the views of 17.4 million voters? Liam Fox virtually said as much on the Andrew Marr programme this last Sunday. “They, almost to a man and a woman, seem to expect a second referendum to result in a vote to Remain.” No, that doesn’t follow. The resistance by Brexiteers to a second referendum is adequately explained if they believe there is a significant risk of a Remain vote, they don’t have to believe a Remain vote would be certain. I think Tony Blair would also have been opposed to rerunning the 1997 General Election, even though the overall result probably still would have been the same. I think the betting markets are often a useful guide. I see that Paddy Power is currently offering 2-1 against Remain winning in a referendum in 2019 and 5-1 against Leave. So their analysts and those who place the bets appear to think that, if there were a referendum, there is a probability of 2/3 of Remain winning (and 1/3 of Leave winning). Of course this is probably more than the probability if some dictator were to order a referendum now, because MPs would be more likely to back a second referendum if there were a high level of public support for Remain. But of course betting markets also get it wrong. Many of us remember how they were offering about 10-1 against Leave in the evening of referendum day.